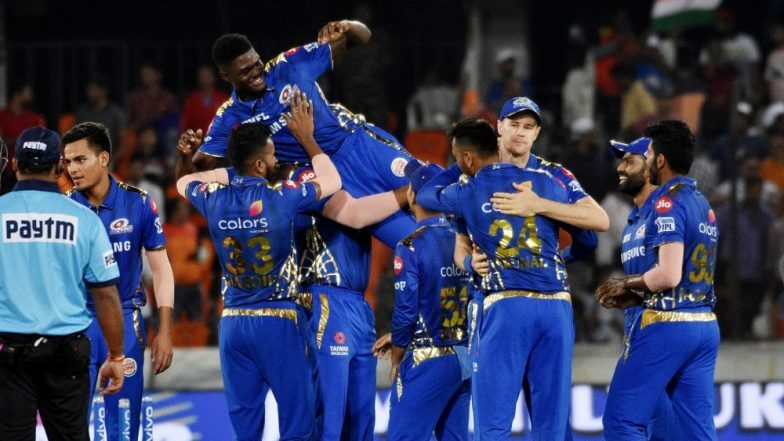 Hyderabad, April 7: Mumbai Indians skipper Rohit Sharma heaped praise on Alzarri Joseph who recorded the best bowling figures in Indian Premier League's (IPL) history, adding that it is important for the team to win games at the start of the tournament. Joseph (6/12) rewrote the record books after registering the best-ever bowling figures in the league's history as Mumbai got past Sunrisers Hyderabad by 40 runs in a low-scoring encounter here. "It was a sensational bowling effort from Alzarri, to bowl like this in first game. He's come in on a lot of confidence from the CPL (Caribbean Premier League) and he's carrying it here," Rohit said at the post match presentation ceremony. Joseph bowled in-form David Warner off an inside edge with his very first delivery in the league to get off to a dream start. He then went on to remove India all-rounder Vijay Shankar in his following over, the seventh of SRH's innings, before returning in the death overs to add four more to his kitty in a record-shattering debut. IPL 2019: Windies Pacer Alzarri Joseph Joins Mumbai Indians Squad, Replaces Injured Adam Milne. Mumbai registered their third win by successfully defending 136 against the Sunrisers on a sticky wicket. "Yes, very pleased. Winning the game is obviously a great result. I thought 136 wasn't a great batting effort, but we bowled in the right areas, kept them guessing all the time and held our nerves. We were in the game till the last ball which is what we spoke of," Rohit said. "We didn't bat well to start with, kept losing wickets and we knew after a few overs that it wasn't a 170-180 pitch. "The pitch was under covers for a day, it was raining as well and the wicket was a bit sticky. So we knew that 140 would be a good score to defend because we've got the quality in our bowling and we back them to defend whatever we get," he added. Rohit said the plan was to get rid of Sunrisers' famed top order which has the deadly opening pair of Warner and Jonny Bairstow. "The bulk of the runs were scored by the top-order, but it's not that their middle order wasn't good and we wanted to exploit that. "We knew that once we got an early wicket we were in the game and with the spin and the seamers we have, we knew we could knock them out in the middle." Mumbai, three-time IPL winners, are traditionally slow starters. But Rohit stressed it's important to bag points at the start of the competition as it gets hectic towards the back end. "We want to win as many games as possible at the start because we know how hectic it gets in the end. A few of the guys leaving for the World Cup doesn't help either. "To start the tournament is important and the last two games shows the quality we have in our squad. Again, we needed characters to step up - Pollard came in and played that knock towards the end which was very crucial in contributing to the total. "All the bowlers then stepped in and contributed with Alzarri."